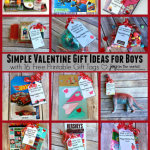 Simple Ways to Celebrate Valentine's Day as a Family - Joy in the Works On a good year,the kids and I will be searching Pinterest for fun, homemade Valentine card ideas. Some years, its off to Target we go for the boxes of cheap Valentines. 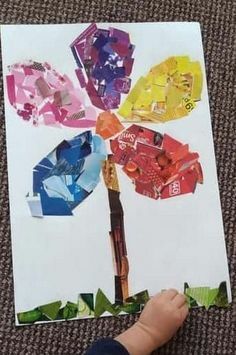 There is nothing wrong with those, of course, but the years we make something, the kids have such fun helping and getting the cards and candy ready for their friends. Now, the name signing is another story. 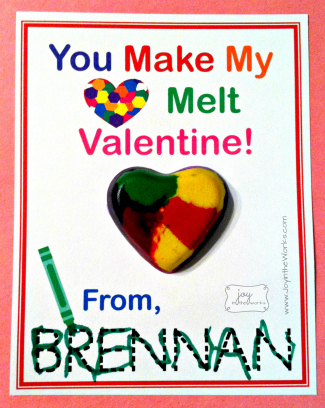 If you haven’t already, check out my post about how to make Valentine making and name signing (almost) painless! On a really good year, we do something like this where, instead of doing random acts of kindness, we do 14 Acts of Sharing God’s Love. 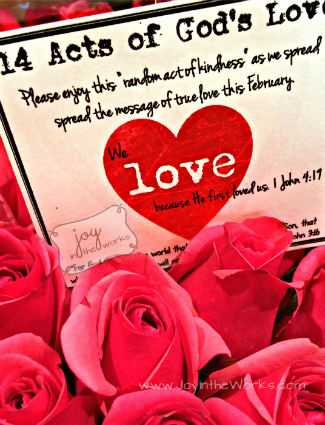 We decided to take the theme of love during February and use it to share the never failing love of God with others. 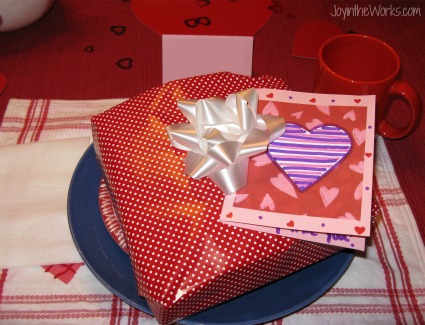 From card making and delivery to nursing homes and delivery candy secretly to the neighbors at night, these 14 activities were a great way for us to celebrate Valentine’s Day as a family. 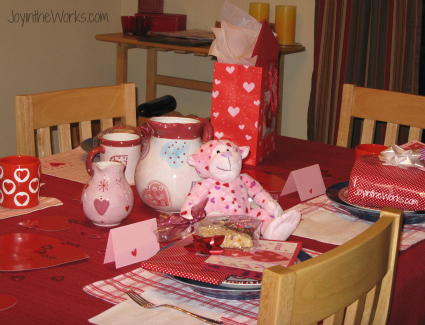 Although it isn’t a surprise anymore, every year when the kids wake up on Valentine’s Day, they find the breakfast table decorated for the occasion. I use paper hearts, garlands and Valentine confetti. I also get out the Valentine plates and pitchers and we make pink heart shaped pancakes, as well as use our Valentine mugs for hot chocolate and marshmallows. At each table setting, I always add a small treat, a gift and a homemade card. I love that my kids get a homemade card from their mom every year- even if they don’t appreciate it, I have fun making them! Since we just got through Christmas and I don’t like to give my kids a lot of chocolate or candy, I end up doing something simple like a small treat and a small toy or a Valentine’s Day book or movie. 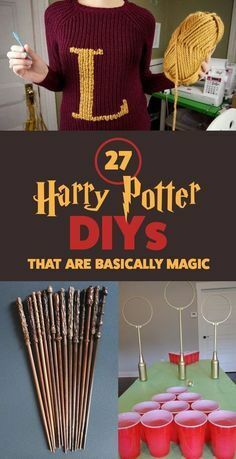 I posted some (affiliate) ideas at the bottom of the post if you are looking for ideas of you own. 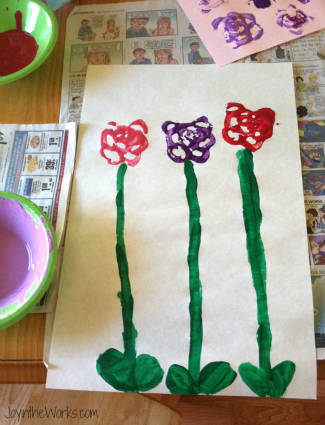 If I have a preschooler at home with me on Valentine’s Day, I like to do a special art project with the him or her. 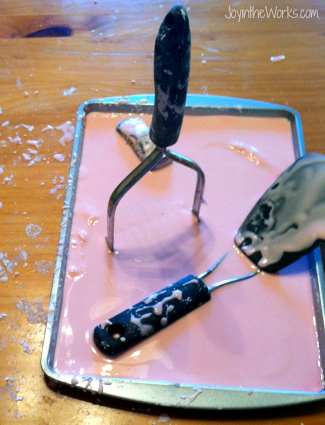 We have had fun with red playdough and heart cookie cutters or one time we got messy with pink gak (corn starch and water). 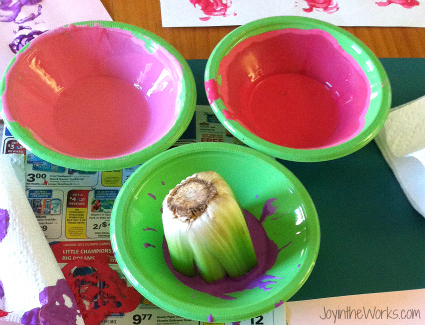 One year I was extra motivated and I finally did that cute project I have seen all over Pinterest: celery rose prints. 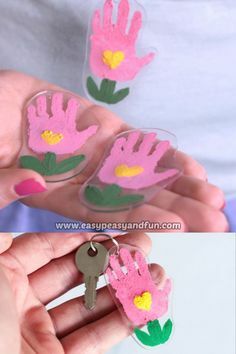 Here are the ones we made, but there are lots of variations like this one from Mum in the Madhouse or this one from Crafty Morning. Sometimes after school or while I am getting dinner ready, we might get to watch a special Valentine movie (check out my picks below). 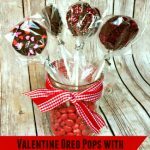 And if the kids didn’t have too many treats at school, we might enjoy some Valentine confetti from Nest of Posies or Smores Valentines Mix from A Night Owl blog. 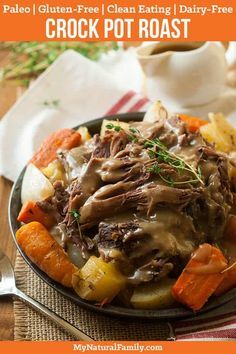 This actually might be one of my favorite times of the day on Valentine’s Day and I am not a fan of cooking, so normally I dread the dinner hour! 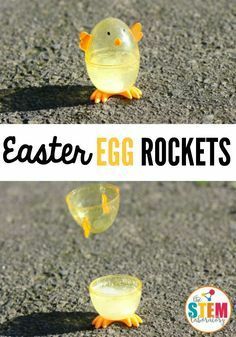 But there are some great, easy ideas out there. 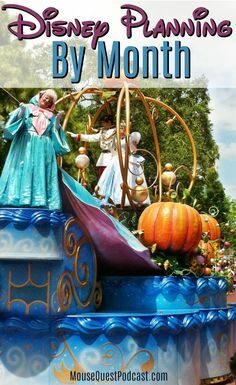 Again, check out my Pinterest page for ideas and inspiration. My personal favorites have been ordering a Heart Shaped Pizza from our local Papa Murphy’s Pizza. Or you can often buy heart shaped pasta and pair it with red sauce from Cost Plus World Market. Sometimes we just pick up Chinese food and pair it with some sparkling cider for the kids. We toast to each other and everyone shares what they love about each other. But mostly, the kids just love being included in the celebration and the special meal makes them feel happy and loved. 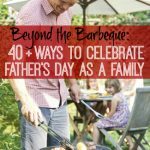 If we got in an early dinner, there might be time for a family game (or the movie could be held until after dinner), but usually we are just trying to get the kids in bed so we can get some time just for Mommy and Daddy! In fact, we let the kids know that it is important that we get time together too! There are so many good romantic movies you can watch together after the kids are in bed. Pick one, add a special dessert, a blanket and maybe a fire in the fireplace and you are set for the perfect romantic evening! Reading to each other can be surprisingly romantic. And it doesn’t have to be Emily Dickinson’s love poems either! Any poetry or short stories will do. Again, this could be a regular board game like Monopoly or your own special version of the game. Check out The Dating Divas for great couples’ games you can create yourself. I may only draw stick figures, but I would still be willing to sketch my husband! Or take it one step further and set up canvases and paints and a vase of flowers or paint a landscape like they do at all those wonderful wine and paint places that have opened up recently. Create a spa at home. This could include a bubble bath, massages and pedicures. Don’t forget the fruit infused spa water and relaxing music! Those are just a few ideas to get your creative juices flowing for a date night at home after the kids are in bed on Valentine’s Day. Do you have any others? 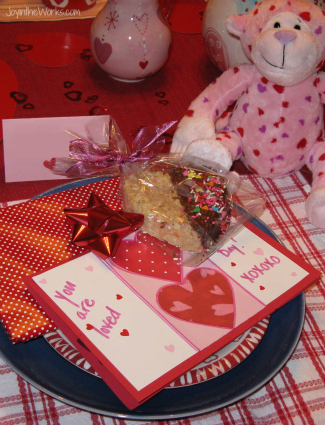 Do you include your kids in your Valentine’s Day celebrations? Are you more likely to go out or stay in? Would love to hear what other couples and families to on this special day.